I like the side lighting. Beautiful shot. What a stunning place! How many nights did you spend in the hut acclimatising? Hi Pete, we only spent one night in the hut, but then camped on the nearby glacier for another few days, before crossing back to the French side and summiting MB. The story behind "View from Torino Hut, Italy"
Some years ago we tried to climb Mt Blanc from France, but to acclimatize and to practice our snow and ice skills again, we went to the Italian side first. 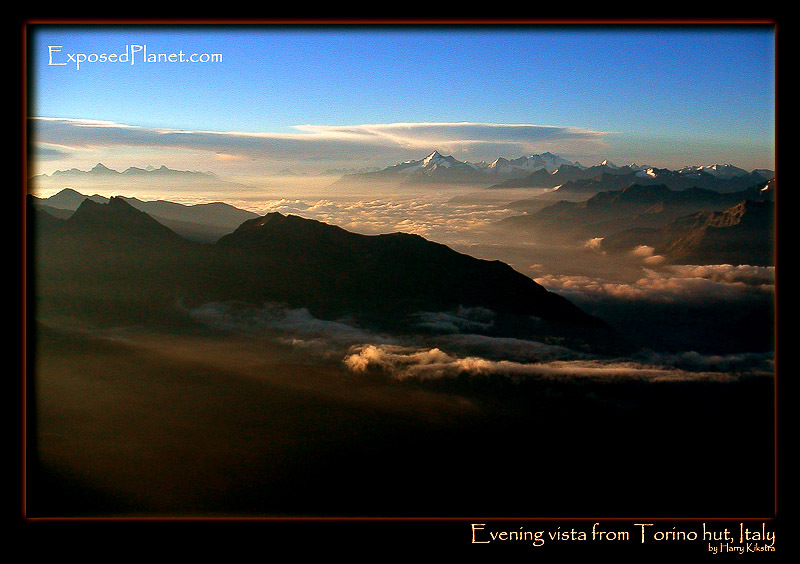 It is very easy to do so as you can take a chairlift to 3500m altitude and spend the night in the Torino hut. >br> From that hut you might have some nice views, to the Dent du Geant, the Italian Aosta valley below or just the play of light with nature as in this image. Coupled with the excellent Alpine hut food a great place to enjoy and relax..